By endorsing Venezuelan opposition leader Juan Guaido as the country's legitimate president, Canada may be setting the beleaguered country up for deadly civil war or exploitation by an oil-hungry U.S. administration, says a Canadian professor of Latin American studies. Guaido declared himself interim president in January, citing a constitutional provision that allows the leader of the National Assembly to assume power for 30 days if the presidency is vacant. He aims to oust President Nicolas Maduro, whose 2018 re-election has been deemed illegitimate by international observers. Roughly 40 countries have backed Guaido, including Canada and other members of the Lima Group, a multi-nation body that includes Argentina, Brazil, Chile, Colombia, Costa Rica, Guatemala, Guyana, Honduras, Panama, Paraguay, Peru and Saint Lucia. John Kirk of Dalhousie University argued in the Globe and Mail that Canada is hypocritical to denounce Maduro while cozying up to other known human rights abusers in the Lima Group. Here is part of his conversation wth As It Happens host Carol Off. 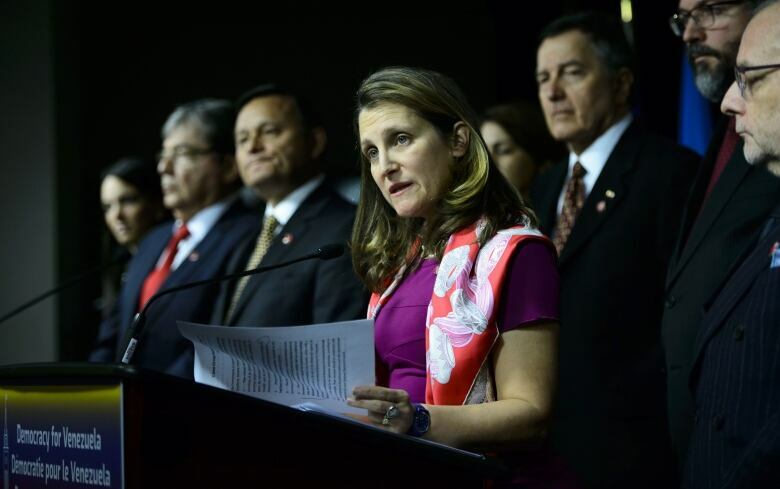 As you know Minister Chrystia Freeland has said that Canada and its allies in the so-called Lima group are simply supporting democracy and the rule of law in Venezuela. So why do you dispute that? The situation in Venezuela is so complicated with such a polarized society with so many arms that are in people's hands with so many different vested interests from outside countries. It's far more complicated and I don't think that people have thought through what precisely might be happening and what could happen and what the motives are. Do you think this group — most of whom are Latin American countries, Canada being the exception — do you not think that they understand how complex this is? I think that if you look at some of the partners that we have in the Lima Group, there's some pretty disreputable presidents and some pretty disreputable situations. Lack of democracy. Honduras and Guatemala are the best example, and Brazil with President [Jair] Bolsonaro. I think that there are vested interests at play in some of the Latin American countries. The U.S. clearly has made it an objective to try to get back into the oil business. My concern is that we're rushing ahead, and I think this is something which should be left to the Venezuelans. The statement they're making is that the Maduro government, the Maduro regime, is not legitimate. This is the statement from Chrystia Freeland, that Maduro seized power through fraudulent, anti-democratic elections and that this is an illegitimate cling to power. So that is the overarching reason why Canada and these other countries are intervening, is it not? Well yes, but I think that if you look at many of the countries that are in the Lima Group, you could make a similar argument. So the question is why show selective indignation to one country, particularly when it has got a massive bloodbath potentially looming on the horizon? Would Canada be doing this if there weren't elections this year? Would the United States be interested in doing this if the oil interests had not been nationalized in 2007 and if the largest reserves of oil were [not] available in Venezuela? I'm afraid of a massive bloodbath, a civil war, taking place in Venezuela because of the polarization. Is that not precisely the reason why Canada and other countries should be attempting to intervene? I think a better solution would be to let the Venezuelans sort it out themselves with the mediation of Mexico and Uruguay and with the intervention of Pope Francis. 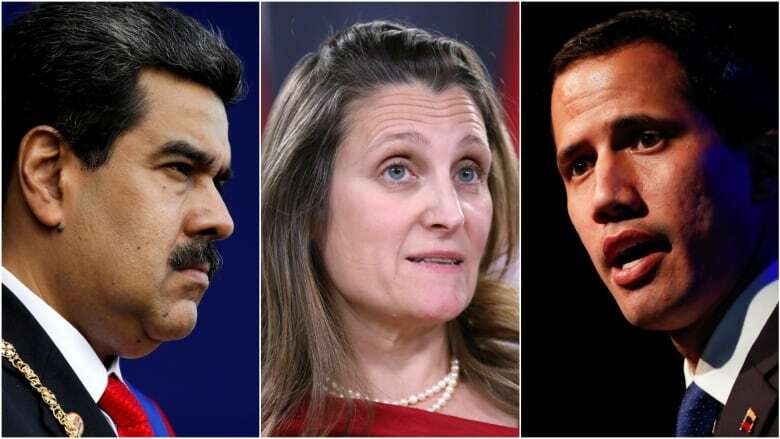 How can Mexico and Uruguay and Pope Francis do any better than what Chrystia Freeland and the Lima Group is trying to do? Mexico has got far more credibility than some of the individual countries that are involved at the moment. Brazil is, of course, the largest country, but if you look at the new government in Brazil I think it has it lacks any credibility in terms of democracy or in terms of bringing about a peaceful solution. I think that, by contrast, having the Pope's involvement, I think that that would have a significant impact. Don't forget, as well, that Maduro — and I'm not defending Maduro — but Maduro in the elections, the presidential elections, received six million votes. The opposition, of course, as you pointed out, refused to participate. They boycotted the elections. The turnout was 46 per cent ... the lowest in its history. So that's one of the reasons why they said that this election was not legitimate. That's right, and I think that the election rightfully has been discredited. But the point I'm trying to make is that [there is] such polarization in Venezuelan society that having foreign powers coming in to intervene — possibly with the best of intentions in the case of Canada, but definitely not in the case of the United States or other countries that are part of the Lima Group — I think this is a recipe for disaster for the population of Venezuela. Written by Sheena Goodyear. Interview produced by Kevin Robertson. Q&A has been edited for length and clarity.